Hey, Where ya goin'? Welcome to I Like Thursdays! No pic but I loved meeting people from the neighborhood at the new coffee group that started Wednesday. Lots of nice people, I have high hopes for making friends. Already one guy said he'd help me landscape the back yard! I sure like the show, This is Us but the finale was on last night. Project Runway is good, although the mentor, Christian Serriano is obnoxious about calling clothes "old lady clothes" in that snarly way only 20 somethings can carry off. Enjoying Survivor and American Idol, Master Chef junior, and New Amsterdam will be back next week. Want to chat about any of those? I've been sewing bunnies every night as I watch tv... look at them... so cute! I like having my embroidery threads in one drawer that can be pulled out of the stand and used as a sewing tray at night... it's all there to choose from. Of course I'm a little stressed because I'm using up my hand dyed thick threads, and walnut shells... it's scary to use something up! It's a good thing to use your supplies though. but I cut a quarter inch outside the line all the way around to make them a little bigger. Also added hand embroidery because it's pretty. I experimented with lots of stitch combos and diff. threads. I filled them with ground walnut shells and they feel great. I have about 8 people to give them to but might have an extra one to give away next week... stay tuned if you want something from my hands. simple and effective, full of texture. Stephen Hawking's book looks fascinating, so I got it for DH and for me, the mystery is my latest fave writer (she's only had three published, this is #2) about a librarian in a small VA town. The last book titled, Women who write are dangerous and is full of stories of authors.... yum! I like everything yummy and soft as you know, And I like my whimzee treat every night at 8 pm. This week I snatched if from Dad, and began gobbling it down when Mama said, "MILO! slow down! There are no other dogs around to take it! We gave it to you so we won't take it! You can chew slower and actually enjoy it!" hmmmm, what can she possibly mean by chew. slower. I don't do slower. I run to the door to meet daddy at night. I pull on the leash to be the first one to smell the next tree. I tear up stuffies as fast as I can. well... I guess I could try that Mama... so give me another whimzee and I'll practice now! whimzees and bunnies and this fab car what looks like made for you... that is perfect...good things come in threes right? That video is adorable! I see that Milo has the center hair part like Scout does! Have a great day! Such cute bunnies! So perfect for Easter. I caught most of the season finale of This Is Us on Tuesday, it's a hit or miss show for me but I enjoyed it. Not quite as much of a tear-jerk episode as others I've watched. I remember being shocked when I found out that the actor who plays the dad is the same actor who played Peter on Heroes. He's a great actor! Great pictures of Milo. Hope you have a wonderful rest of your week and weekend! Cute bunnies. I love the library, and that series by Victoria Gilbert is awesome. Bobbin has taken a page out of Milo's book. We have taken to shredding and unstuffing toys. Thanks for sharing the bunny link and the books and magazines you are reading. I added a couple to my list. And Milo just keeps getting cuter and cuter. The bunnies are adorable! I must give you credit for putting me onto Rhys Bowen's books. I just finished reading the last Molly Murphy mystery. And I've now read all of Her Royal Spyness as well. She's become one of my favorite authors lately. Now I'm reading one of Clive Cussler's new books. Love all those little bunnies. They are adorable. Those bunnies look like a lot of fun! I love how you've embellished them, and the "chocolate" bunny - cute! The book about women writers looks interesting! I'll have to look for that at my library. Loved the pup and kitty video. Very unusual. Those bunnies are so colorful and cool and you're always the cool one Milo! Thanks for joining the Thankful Thursday Blog Hop! Your bunnies are adorably sweet. Love 'em. I have heard of using walnut shells as stuffing, but where do you purchase it? Thank you for the book suggestions. Love Milo! It must be Easter, look at those very cute bunnies. Are you using felt/wool...so nice to embroider. I don't know what I'd do without libraries,truly. Milo looks so majestic in that photo. Cute little bunnies. I bought my walnut shells at a pet store as they use them for the bottom of cages. Bought a large bag. Libraries are a good resource for quilting books. If they don't have it, one can interlibrary loan a title for a couple of dollars. Happy Thursday! 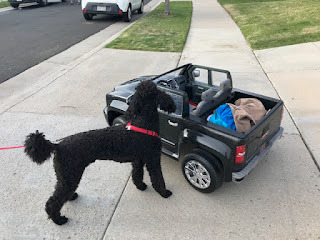 What would it take to get Milo in that little Jeep? He seems to have a bit of a cattitude in these photos...which I LOVE. I'm glad you joined that coffee group, I have been trying to find a group to join and either I can't go when they meet or some such nonsense. Those bunnies are great and a nice thing to do when you watch TV. I was surprised that one of my shows, "You're The Worst" ended the series the way it did, do you watch that show? Thanks for sharing your adorable little bunnies. Also enjoyed the dog and cat video. Your bunnies are adorable! And so is Milo! Too much adorableness! The cat video was so sweet! And your bunnies are squeal worthy! Those bunnies are cute, I will check out the link. Your comment about using stuff up made me smile. I get stressed when I do! LOL . Your little bunnies are adorable, LeeAnna! I enjoy having a "TV project" too. Something to just unwind with while watching sports/American Idol/comedians, that doesn't require too much mental energy or invoke a lot of frustration!